People looking for a relaxing place to rejuevnate have been gathering in Hot Springs, Arkansas long before the Europeans arrived in the Americas. Native Americans met in the peaceful valley to enjoy the healing properties of the thermal spring and declared it neutral ground. Many places claim to be “America’s First Resort;” however, Hot Spring has the best hold on the title because in 1832 it was the first federally protected area. Hot Springs was, in essence, America’s first national park even though it wasn’t official until 1921. A visit to Hot Springs should start on Bathhouse Row at the National Park Visitor Center housed in the Fordyce Bathhouse, one of eight bathhouses constructed in the early 1900s. Many of the rooms have been restored portraying an accurate depiction of how the bathhouses looked and operated in their heyday. 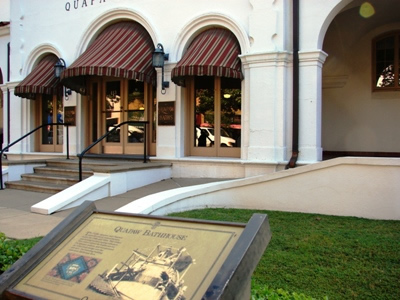 The Quapaw Baths & Spa is the newest of the bathhouses to be refurbished and open to the public. Housed in the 1920s Spanish Colonial Revival building guests can enjoy the therapeutic thermal waters along with other rejuvenating treatments. One of the Quapaw’s unique features is the Steam Cave, a sauna room built around a natural thermal spring allowing the radiant heat from the naturally flowing 143-degree water to gather in the room. The Quapaw spring contains one of the highest mineral contents of all of the area springs. For traditional treatments in an historic hotel that has hosted a variety of famous and infamous dignitaries since 1875 consider the Arlington Hotel. You can even stay in the Al Capone Suite before relaxing in the hotel’s historic spa. You might say Hot Springs is a Spa Town hankering to be an Art Town. 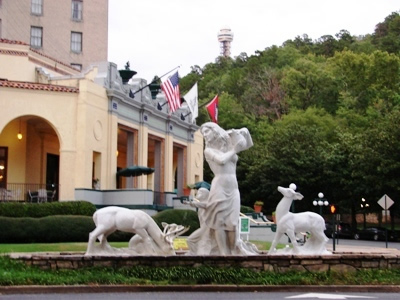 Hot Springs, Arkansas was named as one of the ten best places for “Big City Art in a Small Town” by “USAToday.” One of the bathhouses on Bathhouse Row, The Ozark, opened to the public in 2009 as the Museum of Contemporary Art. 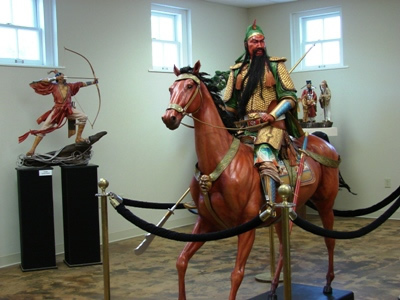 The museum advertises that it "displays one of a kind piece to create a one of a kind experience." The artist, Boban, has created expressive full-size sculptures of athletes, angels, and musicians that show fluidity of motion by welding together spoons. Equally expressive are the works of Liu Miao Chan whose life-like figures in leather show amazing emotion. He says, "Leather is soft, alive, like skin. It is warm and allows for movement. It gives life to the work." The newest bathhouse to be revitalized is the former Hale Bathhouse, which now houses The Three Muse’ Arts Café and Bookstore run by a not-for-profit group that plans to eventually feature visual and performing arts. 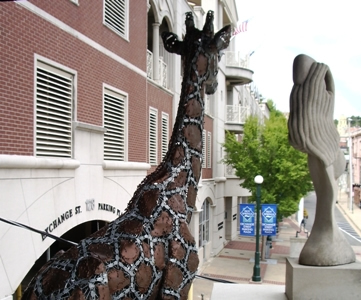 There are several galleries on Center Ave including Taylor’s Contemporanea, Blue Moon Gallery, and Gallery Central where there is something for every taste and pocketbook. Art lovers will find work from emerging regional, national and international artists. Pairing with art are the great antique shops. The third Friday of each month the dealers feature the “Antique Walk” so visitors can enjoy an evening out visiting the antique dealers and boutiques at the north end of the downtown area, which will remain open until 8 p.m. Not to miss is Tillman’s Antiques and Collectible, a surprising collection of museum-quality collectibles including a Louis XV leather portfolio and imperial collections of Napoleon Bonaparte and Louis Phillippe. Tillman’s, an authorized Faberge dealer, have some of the famed, jeweled eggs on display. Today Hot Springs is a beautiful, serene place making it hard to imagine that one time it was a hotbed of organized crime and gambling. Gangsters liked Hot Springs because it was a “happenin’ place” and it became a safe haven for outlaws with the police making sure there were “no problems.” Between 1926 and 1967 it was the largest gambling operation in the US. While gambling was never legal it was basically ignored because locals saw gambling as “wealth redistribution” and liked the money it generated. All that changed in 1967 when Winthrop Rockefeller was elected governor and put an end to the gambling. 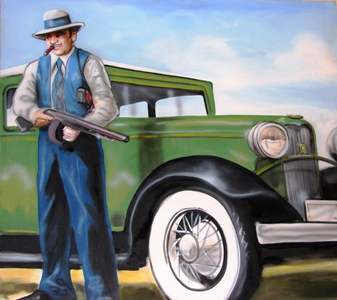 Learn about those early days at the Gangster Museum where the guide details the exploits of Al Capone, Lucky Luciano and other villains who made Hot Springs their home-away-from-home. Someone quipped that there were never bank robberies in Hot Springs because “…all the robbers were there to relax.” The stories are colorful with one Madame claiming she “…preferred a hit man over a politician. You know what a hit man is going to do.” Gangsters are not good role models but they lived interesting lives. Today both the gambling and gangsters are just part of the city’s fascinating past. Not everything in Hot Springs is an indoor activity. Ascend to the top of the 216-Mountain Tower for a breathtaking panoramic view of Hot Springs, the Ouachita Mountains and the areas many lakes. Storyboards tell the history of the area with a video of Hot Springs’ favorite son, President Clinton. Nestled in the valley of the Ouachita Mountain visitors can enjoy hiking, fishing and boating on the nearby lakes. 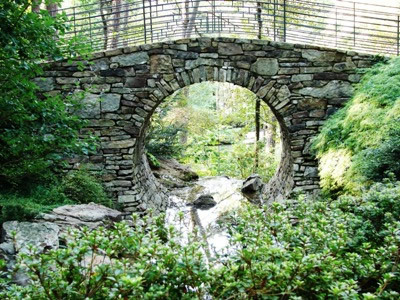 Located just a few miles from Hot Springs, on a peninsula that juts out into beautiful Lake Hamilton, Garvan Woodland Gardens is a 210-acre world-class botanical garden. The trails, mostly wheelchair accessible, wander through the various gardens. The picturesque Full Moon Bridge in the Garden of the Pine Wind is reminiscent of Asia, as is the Bonsai Garden. A do-not-to miss feature is the Anthony Chapel. Time your visit just before the hour. On the approach to the chapel there is a 57-foot tall copper-clad Carillon that chimes the hour creating the perfect mood for one’s first view of the chapel that seems to grow out of the forest. 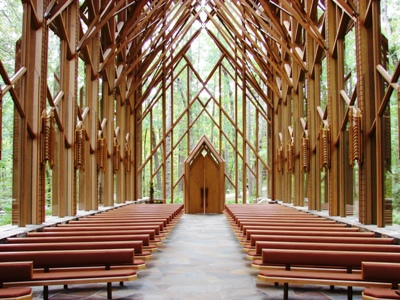 The chapel, designed by E. Fay Jones, a disciple of Frank Lloyd Wright, has soaring glass walls and vertical columns that blend beautifully with the tall yellow pines. Each season at the gardens offers its own special colorful display. Hot Springs is not only spa-tacular but also spectacular with a plethora of activities designed to tickle the fancy of everyone with museums, boutique shopping, great dining, festivals, and nature experiences along with the spas. 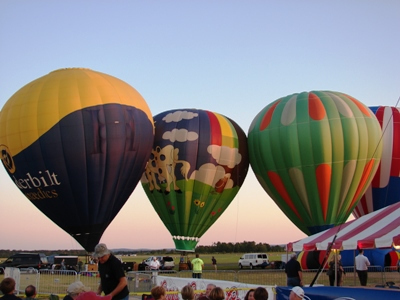 For information on accommodations plus all the things to see and do check hotsprings.org or call 800-SPA-CITY.